Not that kind of quickie, people, my mom reads this blog! I really loved what I wore, so I asked C to snap a few pictures in the kitchen when we got home. Both the skirt and top were last-minute purchases at Macy’s this afternoon, and both were on sale! I thought I would get more mileage from these separates than a cocktail dress. Well, this is already longer than I planned, and I have a date with some sleepytime tea and old sitcoms on TV Land. Goodnight everyone! >Gorgeous outfit! Your smile is the best accessory. :)I love that you wear clothes from several different places. I couldn't make it without Macy's. 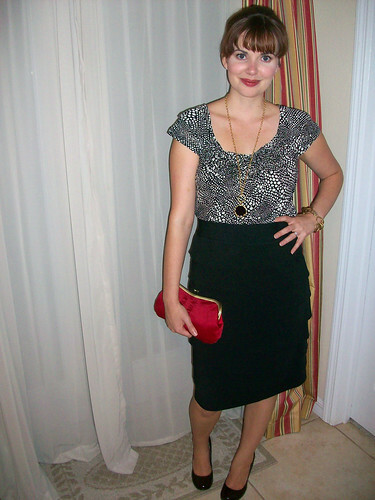 >I adore this look – I love the print and neckline of that blouse, and I love the flash of red from your bag. Such a gorgeous, chic night-out outfit! >Great evening look. 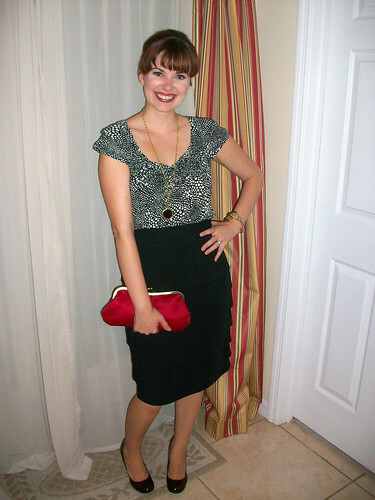 I've been thinking lately that to one of my next formal events, I want to wear two separates instead of a formal dress. You've definitely reenforced that idea for me!! >Congratulations on your award! And your ensemble is killer! I can't wait to see how you put these pieces to use. >Sounds like such a fun night, and your outfit is beautiful! >Love this look. That neckline is just magic on you! >You look beautiful:)I love the red accent.Congratulations on your award! >Wow, great look I can't wait to see how you remix the pieces! >Love that skirt! I totally love the look of tiers, but the bandage style is usually too form-fitting for me…Your tiers are so adorable and wearable! >This is so chic! Bangs look so good on you! >I think these are great pieces and I love black, white, and red… so classic!